I read biographies of the Saints a great deal. Especially in my early years, and my first years of Bible School. I have read about the lives of many great men. One of my favorites would be St. Francis. I use to read a lot of biographies of great men in History. My favorite to read growing up was Abraham Lincoln and Booker T Washington. One well known man that I read about was General Booth. General Booth was the founder of the Salvation Army. As General Booth became older he became an invalid. 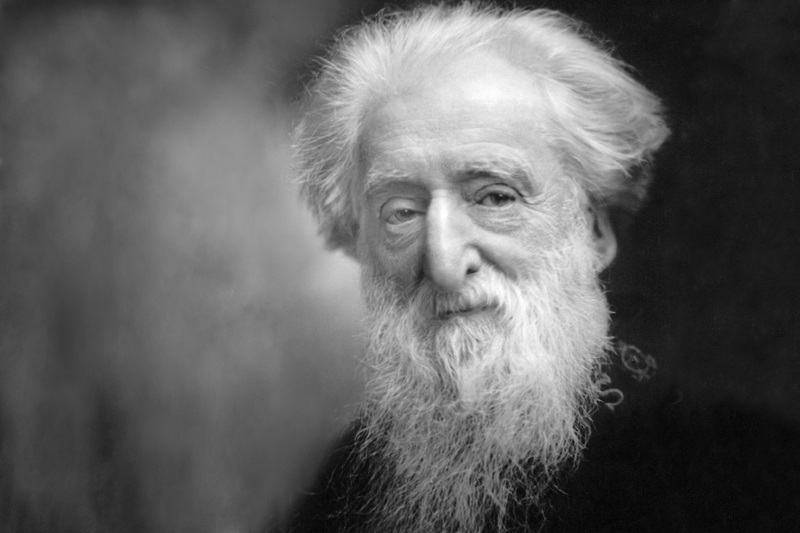 His eyesight failed him, and one year he was in such bad health that he was unable to attend the Salvation Army Convention in London, England. Somebody suggested that General Booth send a telegram or a message to be read at the opening of the convention. General Booth agreed to do so. No one ever exemplified the "others" life as did our Savior. He never typified His life for others quite so beautifully and so clearly as He did when He was on the cross. Our Lord in dying on the cross, suffered as no man ever suffered, agonized as no man ever agonized, and hurt as no man ever hurt. His own race had crucified Him. His own city had hated Him. His own people had nailed Him to the cross. Yet when our Lord opened His mouth on Mount Calvary, the first statement that He made had nothing to do with His own pain or His own suffering, but He said, "Father, forgive them, for they know not what they do." (Luke 23:34) He did not speak of His own suffering. Before He ever cries, "I thirst," He says, "Father, forgive them; for they know not what they do." After awhile, He is going to say, "My God, my God, why hast thou forsaken me?" (Mark 15:34; Matthew 27:46) He will speak in the first person, but not yet. He speaks in the third person when He says, "Forgive them; for they know not what they do." Before He speaks about His own suffering He says, "Woman, behold thy son!" (John 19:26) and "Behold thy mother!" (John 19:27) Before He says, "I thirst" or "My God, my God, why hast thou forsaken Me?" or "Father, into thy hands I commend my spirit" (Luke 23:46), He says, "Amen I say to thee, this day thou shalt be with me in paradise." (Luke 23:43) Our Lord had learned the lesson that most of us never learn, and that is, to live as we ought to live, is to live for somebody else. I don't know who is the most miserable person, but whoever he is, he lives for himself. I don't know who it is who is the most unhappy creature, but whoever it is has never lost himself in service for somebody else. The death of Jesus reminds me of some one else who gave there life for others. Damien of Molokai/ Father Damien. "Father Damien The Leper Priest, the Hero of Molokai. Born in Tremelo, Belgium, on January 3, 1840, he joined the Sacred Hearts Fathers in 1860. He was bom Joseph and received the name Damien in religious life. In 1864, he was sent to Honolulu, Hawaii, where he was ordained. For the next nine years he worked in missions on the big island, Hawaii. In 1873, he went to the leper colony on Molokai, after volunteering for the assignment. Damien cared for lepers of all ages, but was particularly concerned about the children segregated in the colony. He announced he was a leper in 1885 and continued to build hospitals, clinics, and churches, and some six hundred coffins. He died on April 15." One of the quotes he is known for was one in which is found in a letter to his brother who was also a priest. "I make myself a leper with the lepers to gain all to Jesus Christ." "I would not be cured if the price of the cure was that I must leave the island and give up my work I am perfectly resigned to my lot. Do not feel sorry for me." If there is a need among Catholic people today, it is for a baptism of love one for the other. Father Thomas Byles younger brother William had moved to America to run a rubber business. He asked Fr Byles to officiate at his wedding. So arrangements were made for the priest to travel to New York. He was initially supposed to travel on another White Star liner, but changed at the last minute to travel on the Titanic. His second-class ticket (number 244310) cost £13. He boarded the Titanic at Southampton on April 10, 1912. On the morning of Sunday April 14, Fr Byles celebrated Mass and preached a homily which, according to the Evening World, was on the need to have a “lifeboat in the shape of religious consolation at hand in case of spiritual shipwreck”. The following night, the Titanic struck the iceberg. After the collision, Fr Byles helped the third-class passengers up the stairs and into the boats. He also heard confessions, and prayed and sang with those who couldn’t find a place on the lifeboats. (He had been offered a seat but refused.) Eyewitness Bertha Moran later recalled: “Continuing the prayers, he led us to where the boats were being lowered. Helping the women and children in, he whispered to them words of comfort and encouragement.” He died helping others off the Titanic. St. Jerome Emiliani, a priest felt a special call to help the orphans who had no one to care for them. All the loved ones who would have protected them and comforted them had been taken by sickness or starvation. He would become their parent, their family. Using his own money, he rented a house for the orphans, fed them, clothed them, and educated them. Part of his education was to give them the first known catechetical teaching by question and answer. But his constant devotion to the suffering put him in danger too and he fell ill from the plague himself. When he recovered, he had the ideal excuse to back away, but instead his illness seemed to take the last links of the chain from his soul. Once again he interpreted his suffering to be a sign of how little the ambitions of the world mattered. He died in the service of others. As I sit here preparing this devotion I can not help but wonder how many people wonder if our God loves them?" The answer is in us dying to self, denying ourselves for others. Being Christ to them. I hope I learn someday to live for other people. I hope I'll learn what it is, before I see Him, to so bathe myself in service for others it won't matter about self anymore. Oh, my dear brothers and sisters! This is a heartsick, sin-sick old world. Everybody is weeping, and the whole creation groaneth and travaileth together (Romans 8:23-24). Everybody needs somebody to help them! There's a great need. Do you want a job? Do you want something to do for God? Just try to help other people. Oh, my! Honestly, I mean it, Many times when resting my head on the pillow at night I wonder, "How many people beyond my room, my house, my block could use some help?" Out side of my little world of self there are others who have spiritual and physical needs. They could be your next door neighbor you never talk to. It could be some one at work, even in your own family in the next room! That leads us to one of the sweetest things ever written in scriptures. Jesus is dying on the cross. He is God incarnate, the very God of gods, clothed in flesh, the pre-existent, eternal Son of God on earth. He walked among men and now He is on the cross. This is the most important hour in the history of civilization....Calvary! Look at Him. He's dying. Look at Him! That's the Son of God! Look at Him! He had fellowship with the Father before the world was. Look at Him! He's virgin-born. Look at Him! He lived a sinless life. Look at Him! All the teachings and traditions of the Church, every Mass that has been said since that day are wrapped up in what's going on right there on Calvary. If He comes down from the cross, we are doomed: If He stays there, we will have hope for a life in Christ. If he came down we would have no hope and an eternity in Hell. That is how important his death was! Listen! He's opening His mouth; He's going to speak. God Incarnate is going to speak! He has a message for us; I wonder what it will be? I wonder if He will give us a great speech on Justification. Maybe He will tell us something about the great Mystery of the Trinity that none of us quite understands. Maybe He will give us a dissertation on the difference between Transubstantiation and consubstantiation! What is He going to say? Listen! I wonder what profound words will come through His lips? He is opening His mouth. "John, this is your mom. Take her into your home and love her. Mom, this is your Son love him as you have loved me." I am paraphrasing to be sure but, there is something so sweet about that. Why wouldn't He speak about a great doctrine? I'll tell you why! When Jesus died, He wouldn't say, "I thirst," until He took care of His mother. (John 19:28) He died caring for the needs of others. After awhile He's going to say, "My God, my God, why hast thou forsaken me?" but not yet; first He wants to care for the needs of others. Let me say this. You'll never be happy, until you lose yourself! Whatever degree of happiness I've found, I've found in serving Christ and serving others. That's the secret! I didn't see that lady for awhile. It seemed like she was trying to avoid me. One Sunday morning after months had passed, I happened to catch her in the back of the auditorium. I called her by name and said, 'How about that nervous breakdown you were supposed to have?' She said, 'I got so busy I called it off." Listen, the answer is Others! Others! Jesus, God Incarnate, the pre-existent Son of God becoming flesh, with all the sins of all the universe, of all the world, heaped up on his shoulders, suffered as no man ever suffered! He saw the back side of the Father for the first time in eternity, but He said, "John, take care of my mother. Mother, take care of John." He said to the thief on the cross, "This day thou shalt be with me in paradise" He died saving others. Listen to me. I know that when I'm not happy, it's usely because of selfishness; and I know when you're not happy, it's usely because of selfishness. It would be a wonderful thing if we could so live that the theme song of our lives would be "Others." When my time on earth is over and only one word could be put on my Tombstone. 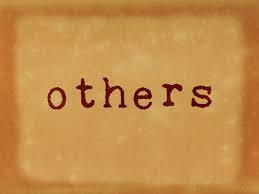 I would wish it to be the word, "Others".